Please, Friend, DON’T BUY STRAWBERRY SEEDS ON EBAY! If you have any desire to plant a garden this year, you are likely already thinking and dreaming of earthen smells and textures and the warmth of the sun. Spring is synonymous with strawberries for many people, and you may even be planning on including some of the delicious red berries in your harvest this year. Please take a moment and read this before you buy strawberry seeds online. Q: When Will My Strawberry Plants Start Producing Apple-Sized Strawberries? Hey there! So I purchased a packet of Fragaria ananassa L. Maximus seeds from a farmer from Tennessee via ebay last year. I didn’t see this variety on your list above but I found out that they are of the everbearing variety and are supposed to produce huge berries that are the size of apples! So after cold stratifying them in the freezer for 45 days, I sowed a few seeds and ended up with one bud! Well, it’s been probably about 8 or so months now and after changing pots to a bigger size two times, I now have a beautiful healthy looking strawberry plant with big green leaves. The leaves are about twice the size of some smaller “normal” sized strawberry plant leaves that I have growing in a planter next to them so I can already see that these are definitely a larger variety. The plant has not produced any flowers yet so I’m still waiting for the very first ones, though I have no idea when that might happen? They seem to just continue making lots of beautifully large leaves in the meantime. Have you ever had any experience with this large variety? Any idea when I should expect its first flowers to bloom? Thank you for the great info on this website! Answer to: When Will My Strawberry Plants Start Producing Apple-Sized Strawberries? 1. Fragaria x ananassa strawberries are hybrids. They typically come in one of three types: June-bearing (which produce the biggest strawberries, but rarely ever apple-sized); everbearing (which produce medium-to-large strawberries with major settings twice a year); and day-neutral (which typically produce small-to-medium strawberries more or less consistently throughout the growing season). 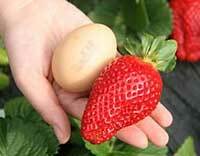 Since the variety, supposedly a Fragaria x ananassa, is a hybrid, seeds from such a strawberry have absolutely zero guarantee of producing huge strawberries, even if the parent plant that produced the strawberry from which the seeds were collected did produce abnormally large strawberries. It is a genetic lottery. Many seeds won’t even be viable (as you may have encountered with only one germinating). 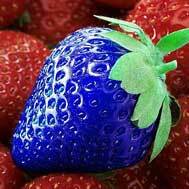 In fact, since plants that produce strawberries as big as claimed by the individual who sold you yours are exceedingly rare, even if the seller was telling the truth, the odds of you getting seeds from a strawberry from the plant that produced them for him that do likewise is essentially nil. All reputable seed sellers know this and, consequently, don’t advertise such things. To get genetically consistent plants, it is easiest to buy strawberry plants instead of seeds, so many retailers deal in dormant or potted plants instead of seeds. 2. Apart from the fact that the seeds were advertised as hybrids as just discussed, they were also advertised as everbearing. It is likely that the seller doesn’t even know what that means. He probably just thought, “Hmmm, everbearing must mean it bears forever. People will like that. I’ll go with that type for my advertisement copy! And, people like big. I’ll go with apple-sized strawberries forever, for the win!” June-bearing strawberries put forth virtually all their berry-producing effort over the course of two to three weeks in the spring to produce a heavy set of very large (relatively) strawberries. June-bearers are what you usually buy in the store and in roadside markets or farmers markets. Everbearing varieties produce, on the whole, both a smaller number and smaller size of strawberries than do June-bearing varieties. However, there are a few varieties that can come close enough to matching the overall production of June-bearers. The point is this: no recognized everbearing variety produces strawberries that are consistenly, or even commonly, apple-sized. 3. Large green leaves don’t necessarily mean that the plant will produce large berries. In fact, if there is too much nitrogen, potassium, and phosphorus available to the plant (over-fertilized), the plant can produce an abundance of over-sized vegetative matter and fewer, smaller strawberries. 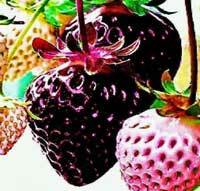 There are other reasons why a strawberry plant won’t produce strawberries as well. It is likely that the individual who sold you strawberries either intentionally misled you, just christened some random strawberry seeds he had with new verbiage to help them sell better, or was taken in by whoever sold him the seeds he then resold to you. While I’ve been around the strawberry world for a while now, it is also possible that I just missed where the new everbearing variety called ‘Maximus’ that produced apple-sized strawberries hit the market. If you have more information on it, please do send it my way, and I will stand corrected! There was a ‘Maximus’ strawberry variety that was commented upon in an 1897 edition of a gardening guide put out by The Gardening Company, but I doubt that is what is being advertised today. On another note altogether, it sounds as if you are doing a splendid job caring for your strawberry plant! You have germinated the seeds (which can be difficult), grown the seedling successfully, and transplanted it according to increasing space requirements. That takes quite a bit of green-thumbery! Congratulations! As to your question, you might start seeing flowers and fruit before much longer. Perennating buds in the strawberry plant’s crown are formed the autumn prior to the spring’s harvest the following year. Typically, those buds are formed in the crown, the plants then go dormant over the cold winter months, and then the perennating buds emerge as flowers the following spring, are pollinated by insects, and will set as strawberries a couple of weeks later. Since your plants have been inside, my guess is that they are probably getting ready to send up flowers from their perennating buds now. So, patience is still likely the best course! Give them some more time, continue your good plant care, and you’ll see rewards for your efforts eventually…even if the berries aren’t quite the size of apples. That video was made on April 8th, 2015 and I had maybe about 11 or so fruits during that first phase of production. It’s now May 27th, 2015, so a month and a half later, and it’s going through a second growing phase and has about 15 berries that are in various phases of growth, one of which is ready to be picked right now. Though the interesting thing is that the very first berry that you see in the video I posted above was the biggest one out of all of them that have grown. The rest have been slightly smaller. Why do you think that is? I assume it has something to do with the plant maybe not getting enough nutrients/fertilizer? It would make sense that the first fruit was the biggest because prior to that one, there were no other berries growing yet and so that first one got all the resources it needed to become as big as it could become. But now that there are all these other berries growing, I imagine that they are all using up the available resources (nutrients in the soil, etc.) and there might not be enough to grow the berries to their full potential size. Do you have any recommendations on what I should do in order to give them the maximum amount of needed nutrients but without over doing it? I have recently added a new layer of soil to the top layer of the dirt with the idea that it would give the plant some needed nutrients as they seep down into the older soil. Oh, and one more thing I’ve noticed recently within the last several weeks… I’ve been finding these very small green caterpillars on the leaves and on some of the growing berries. They are very small, about a few centimeters in size, but I’ve discovered about 8 of them or so over the past several weeks. Do you know what they are and how best to get rid of them? I’m glad you’re happy with the size and taste of your strawberries! The first strawberries are often the largest on each plant as more resources are available to put into growing it before the demand of the rest of the berries starts to detract from the overall nutritional availability. As for pest management, this might help. See here for more on growing strawberries. Good luck, and thanks for the update! Hello there! Thank you very much for your well written response to my question(s), I appreciate the time you took to gather the appropriate information in answering my questions. I’m not sure if you received my email or not but literally the day after I submitted my question to you, I noticed my plant’s first flower bud beginning to emerge from the crown! It’s been about 3 weeks now since that day and I’m please to report that not only did that very first bud turn into a flower and then was successfully pollinated, but there were (are) 5 more buds/flowers that have emerged and are growing as well! While I understand from what you told me that these strawberries will most likely not be the huge apple sized ones that I had hoped for, I’m still excited to check the plant each day and see the progress of the berry as it grows larger. It’s just about the same size as fully grown ones from my regular smaller strawberry plants that are sitting next to it, but it appears that there is still plenty more growth to go because the seeds are all still very close together which to me, makes me think that it still has plenty of growing to do because I know the seeds on the outside of the berry eventually spread out as the strawberry increases in size. So it’s fun watching it grow and who knows how big it will get, time will tell! I’m glad your plants are growing well! Watching them mature into fruit-bearing plants is one of the most fun aspects of gardening! Keep us updated on how your plants do, and how big your berries get. And, while I don’t sell any seeds myself, you can buy them from reputable suppliers here (plants here). Good luck!